This year Christmas sneaked up on me, ambushed me in the middle of trying to feel a bit more relaxed about my work, and completely everhauled me in a matter of days. I can’t really explain how it all happened, but suddenly it was alreayd the 2nd advent Sunday, my kids were complaining about a lack of christmas baking and M. was sneaking out for an intensive work week in Barcelona, leaving me to make sure all Christmas presents were bought and eventually wrapped, biscuits baked, kids with the correct Christmas outfit in school – it’s amazing how many different Christmas events they manage to fit into a week with a different arrangement for dressing (uniform in the morning, party outfit in the morning; school uniform with christmas sweater all day; christmas sweater or headgear for quick add-on during lunch…). I quit participating in craft markets a long time ago (a decision I’ll have to re-evaluate for the coming year), but I decided to join in at two mini fairs: one at Backlit galleries, for which I decided to bring printed Christmas cards, and I let myself be persuaded to bring cards and some pieces of art to the Christmas fair at the German language school where I was teaching. First lot of cards: dowloaded a lot of flags, added my own distress pattern, then print this car on it by hand: voilá, travel themed greeting cards. 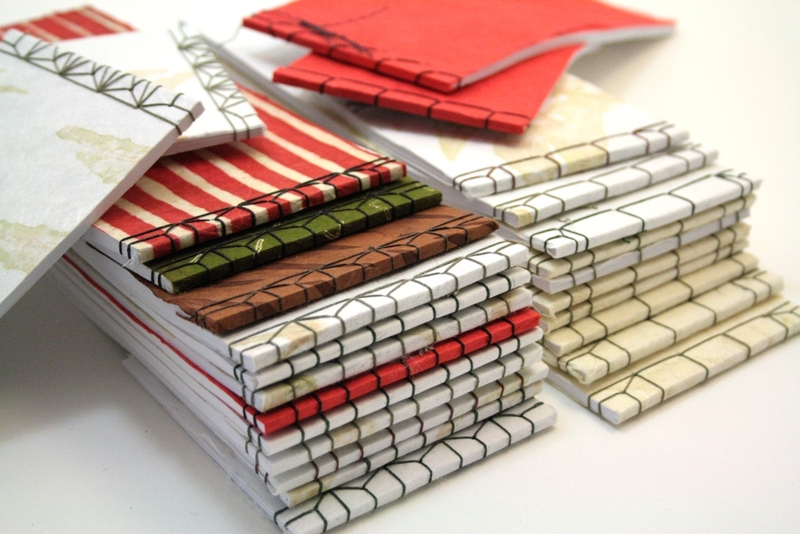 And so my December was suddently full of delightful – and busy printing. Some of those prints were robots. But I failed to get the full number of 12 full. Nevertheless the challenge was fun, and I might extent it to January. For now I would like to show you the different printing I made and finished in the last couple of weeks. 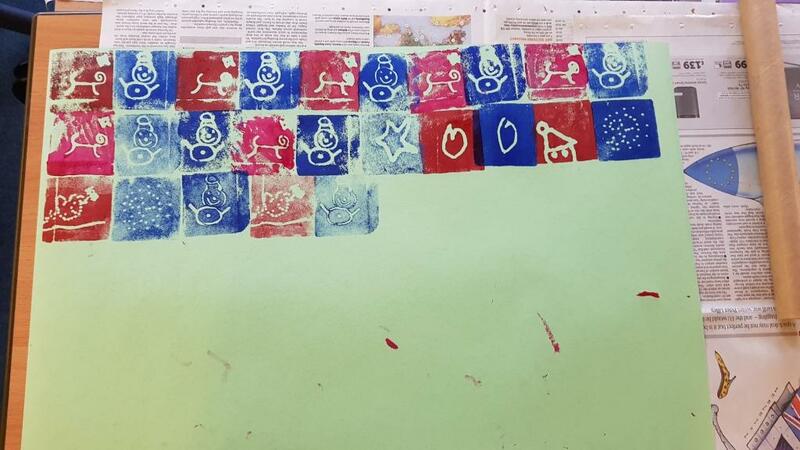 First up was the printing session with my 7-8 year old pupils at the German academy. 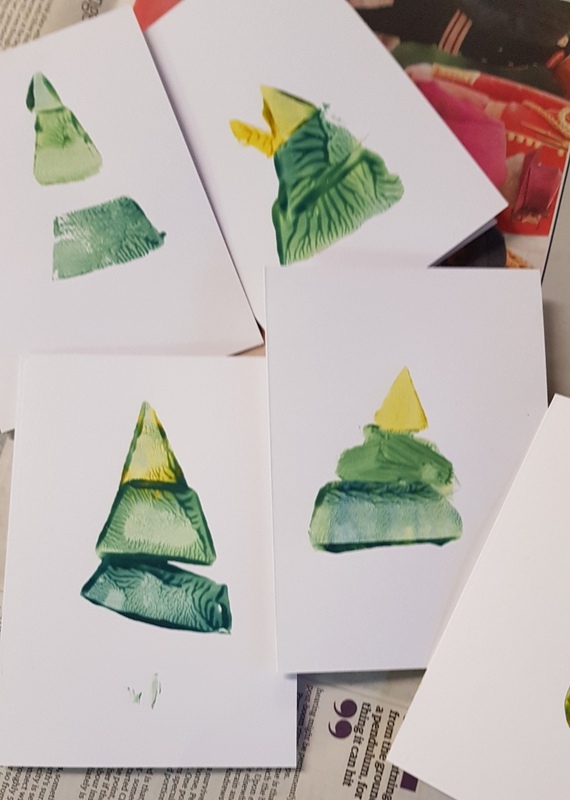 They made wonderful Christmas cards and giftwrap together, using different alternative printing plates and – which made things hard – child safe inks and paints. 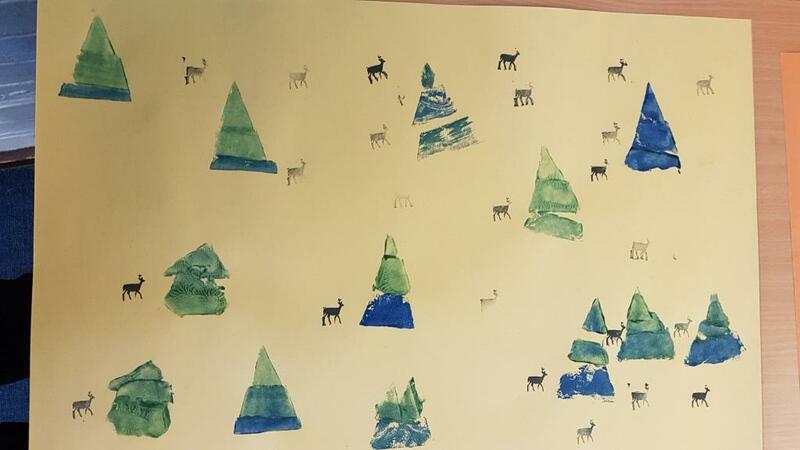 After the first printing session at school, I started printing my own Christmas cards at home. I decided to finally try out my printing screens. 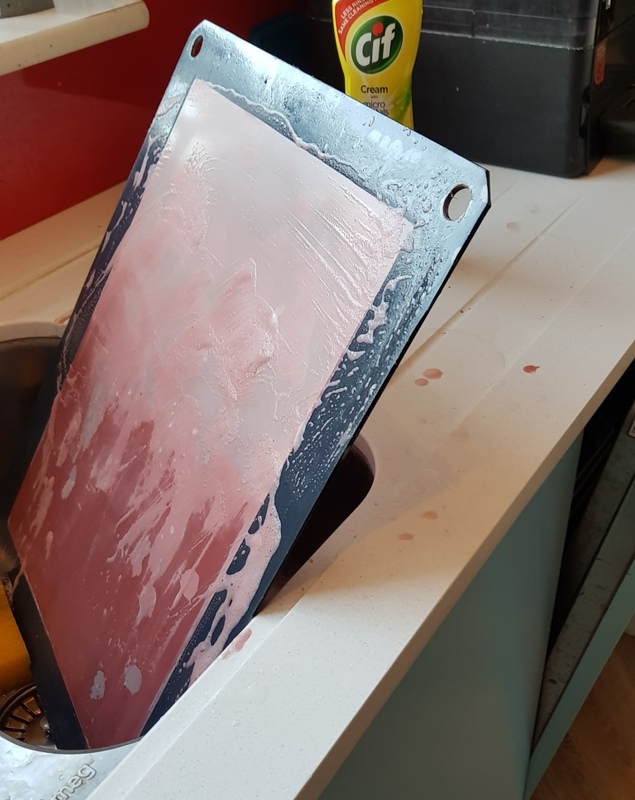 I bought screens, photo emulsion, as well as drawing fluid and screen filler already two years ago, and then was always afraid to actually try it out, because I wasn’t sure I could successfully reclaim my screens afterwards. Finally I overcame my anxiety: What good does it do not to use something out of fear of not being able to use it again anyway? 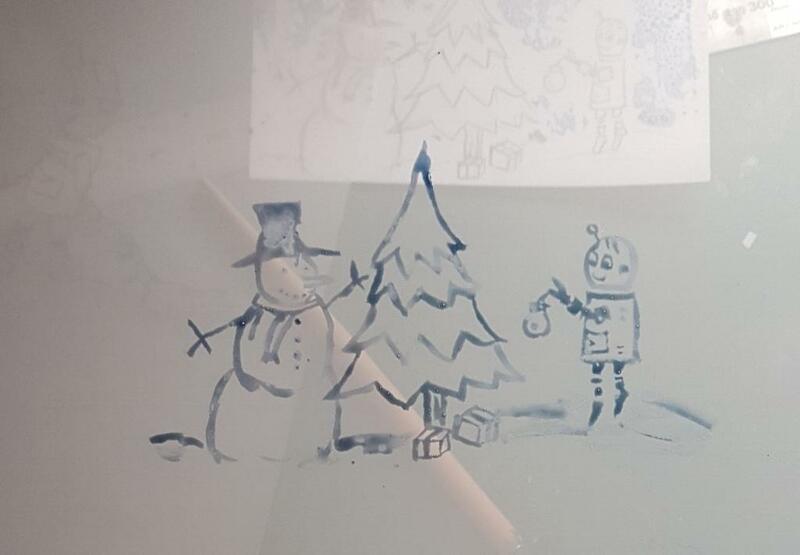 It was surprisingly easy: I made a drawing first on a piece of paper which I then placed underneath the screen I was going to use.I propper up the screen slightly, and then, with a brush, put my drawing on the screen with the drawing fluid. The fluid is slightly sticky, it’s a bit like drawing with liquid glue, but easy enough. 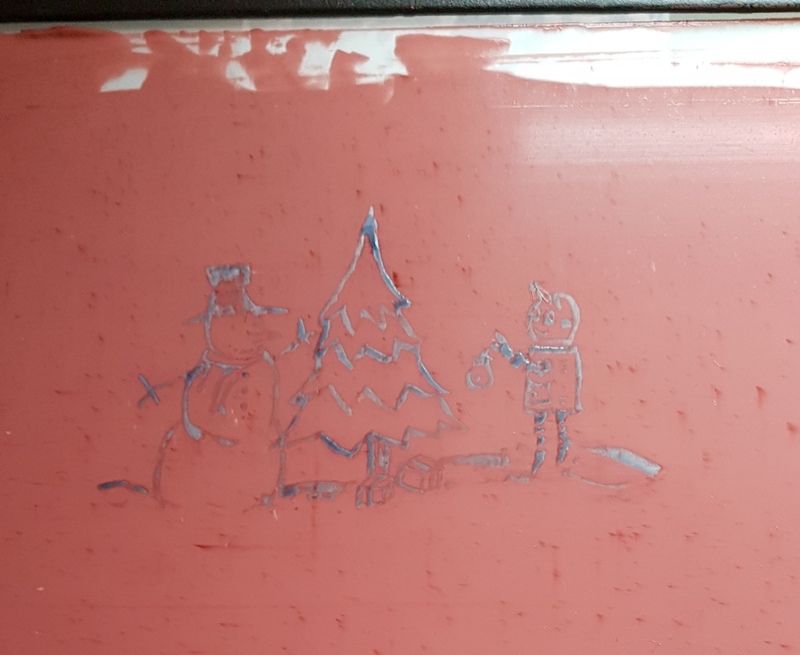 When this is completely dry, the screen filler is dragged across the screen, and when this is dry, you can simply wash out the drawing fluid with some warm water. – And the screen is then ready to pull the first prints. I rather liked the quality of the image produced, and can well imagine to experiment a bit more with this. Reclaiming the screen was also easier than I feared it would be: I used a filler that can be removed with a mild abrasive household cleaner. After about 15 minutes of scrubbing, the screen looked good as new. The other printing plate I experimented with this year was a so called “easy printing plate”. This plate consists of a foam, mounted onto a piece of card. You can then either score this with a pen, and then the marked line won’t ink up. 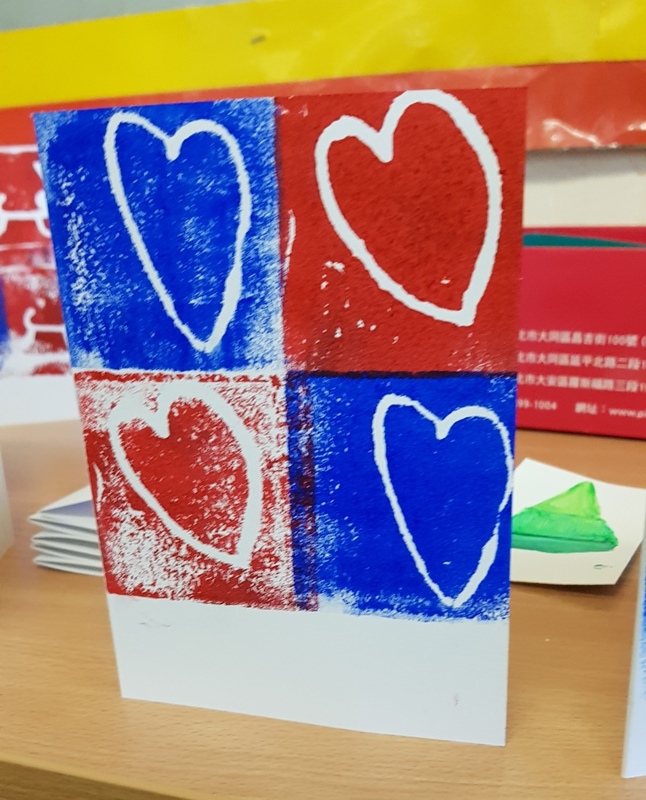 I used this technique with the kids in school (see above the card with hearts). But with a paper scalpel it is also easy to cut and pul the foam and then just unk up what remains. 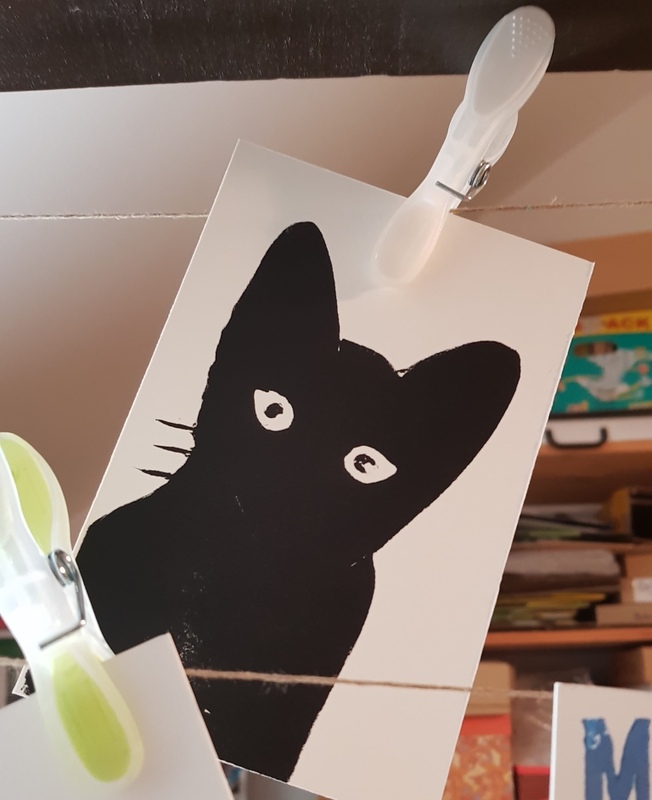 – I am rather pleased with the cat print I made in this way. And with the cats prints still slightly wet, I then set off to the first Christmas evening at Backlit. 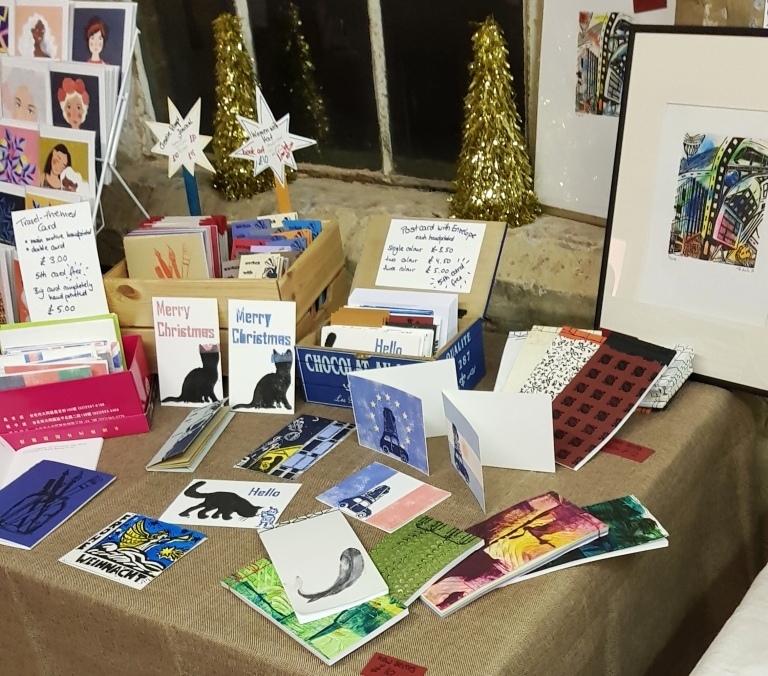 At the table directly beside me, someone had set up an Adana and offered self-printed (letterpress) Christmas cards. I was hit by an extreme case of press-envy. Unfortunately a lot of the type is in disorder, and I’ll probably spend the next year sorting type. – If I can finish in that time! 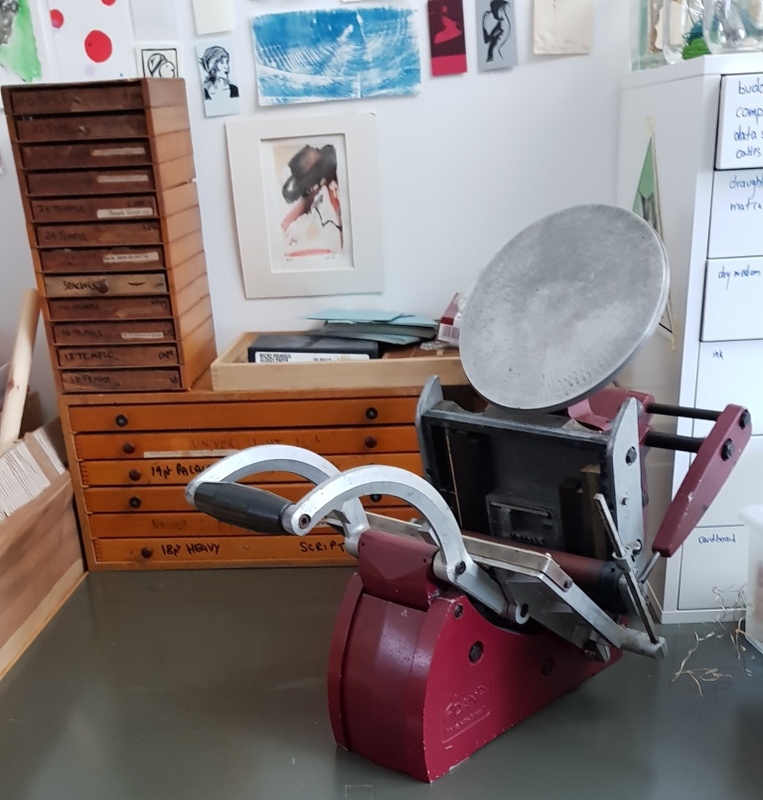 I am also looking forward to using if for printing lino. The format is good for printing cards, too. So maybe I’ll have to produce more cards in the coming year. What are your Christmas gifts – self-gifted or received by others? And what are your plans for the next year? Do these two count as two robots? Then I am still on track with my challenge, but so far I didn’t manage more than this one scribble. I might catch up on the weekend, though. I did try and go for walks, as I notice that this really helps my creativity. 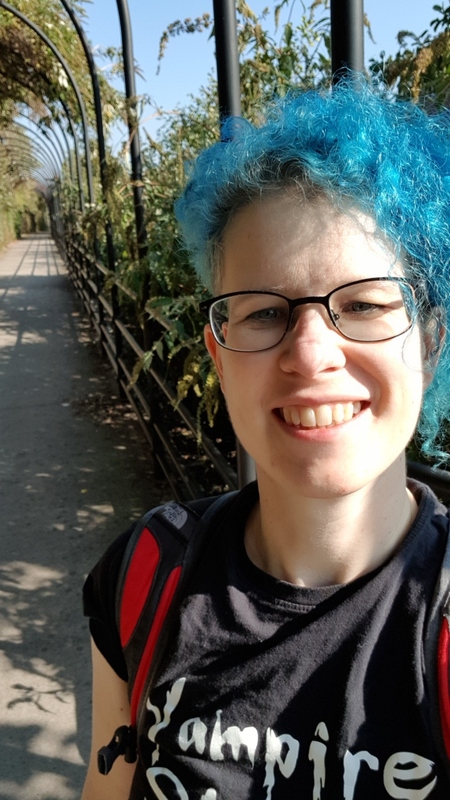 Last week, I ventured into a “nature reserve” nearby. 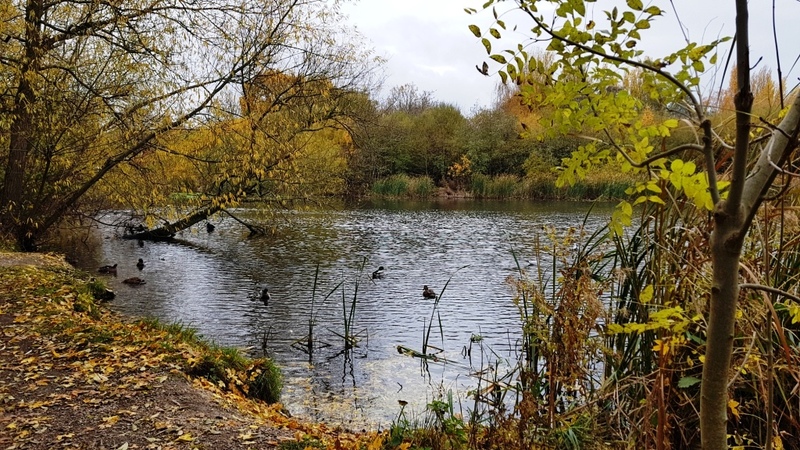 I don’t know whetehr this is an English or a Nottingham thing, but there are a lot of so called nature reserves among residental areas, some are big, some are small, all feel to me like I wasn’t living in a big city after all. The photo I took maybe 15 or 20 walking minutes away from our house in the area where we live. Today then I decided to turn the other way and walk past the city borders. The photo below was taken after maybe a 30 minute walk. 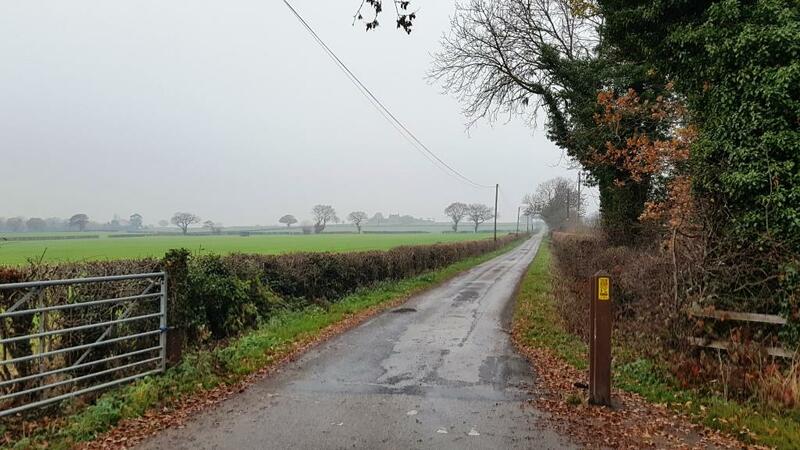 Although the landscape looked really nice (Novembery-autumny-English), it turned out a bad idea to venture out that way: I had to walk close to a street on a narrow sidewalk where cars sped past me at the permissable speed outside cities. And when I decided that I had enough of this and wanted to take the bus home, I had to realise that my bus card wasn’t valid (because I was outside city boundaries). Well, what you don’t do to wake the muse. Can’t say it worked on this occasion. I was too worried that I would be run over by a car. The pile I made 8 years ago. Stocks are running low now. To mark the occasion, I re-edited the instructional post I made at the time to include the old photos; why don’t you check it out here: Enjoy! 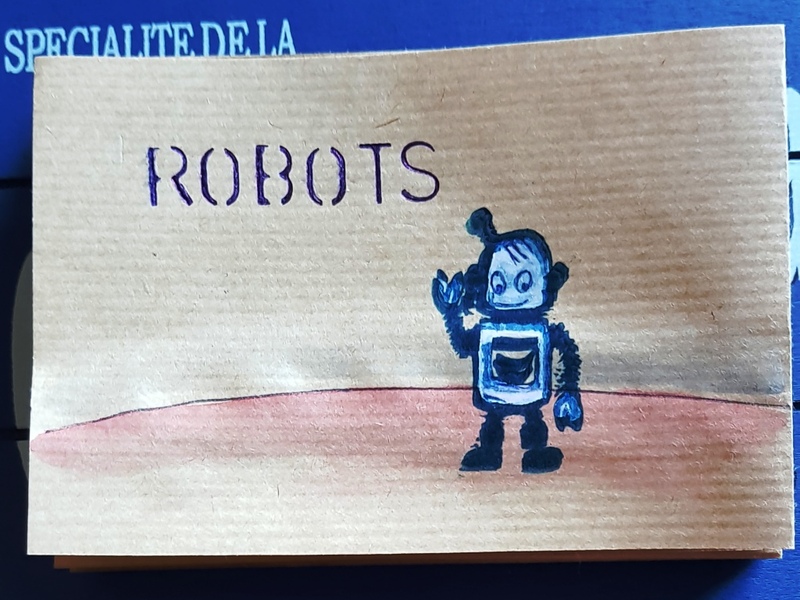 In my last blogpost I challenged myself to a six weeks, 12 robots project. 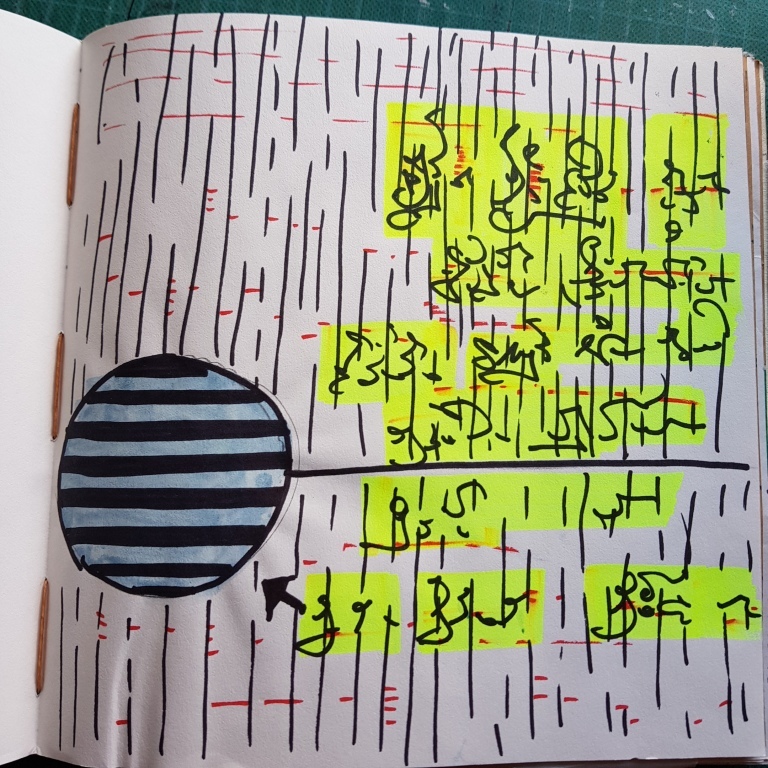 And this is how far I got: I made myself another of these maze-journals I love to keep for my daily sketches. I had them also for my fish and beach findings projects (if enough people speak up, I’d love to show those, too!). I am not really happy with any of what I produced this week. 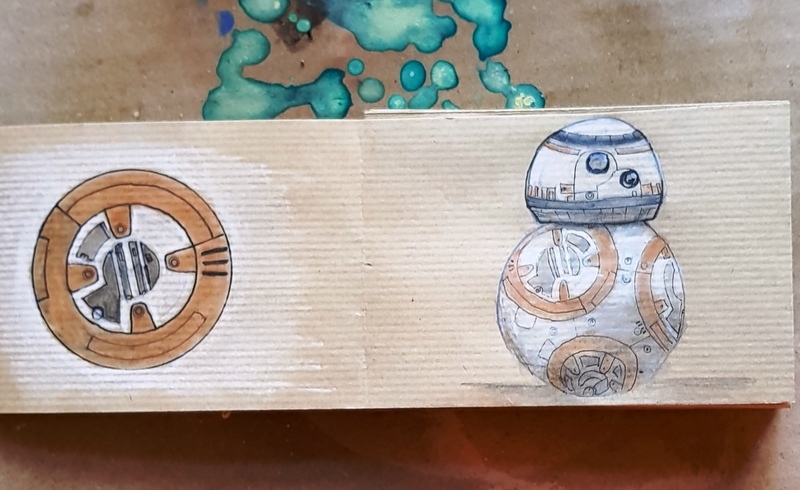 I started off with BB-8 (although followers of my instagram account will know that it was the second robot I shared there). I essentially looked at a picture and tried to copy it. I thought I needed to get a feel for robots, and kind of went with it. As a copy from a picture goes, I think it’s o.k., but this is just not what I had in mind for this project. 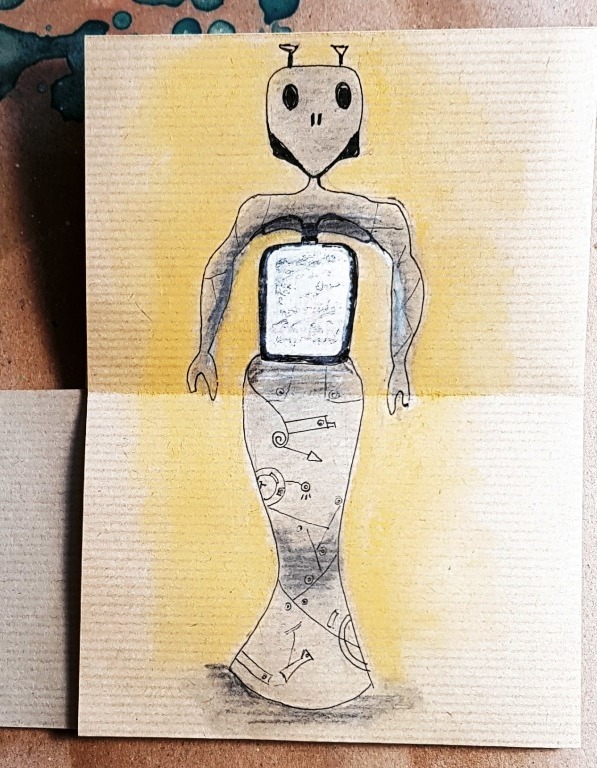 The second robot I drew was the lady robot with the ipad stomach. 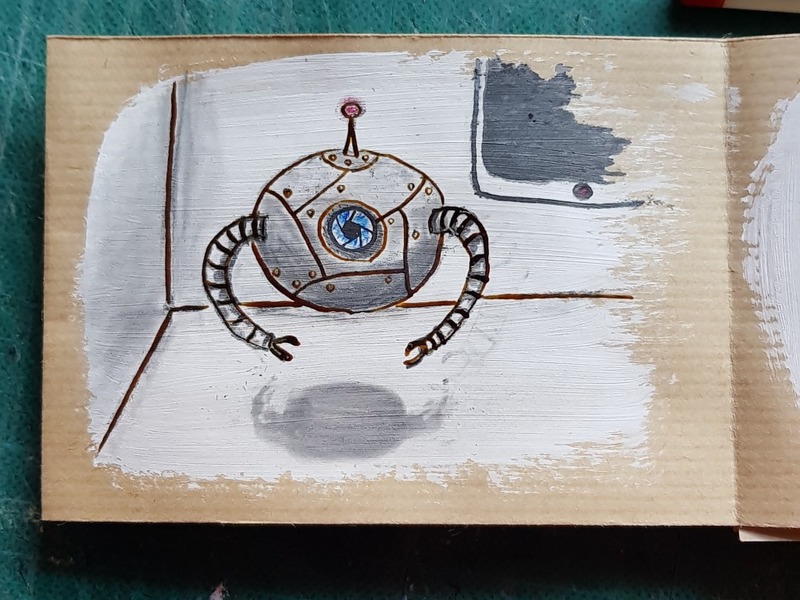 It was on the same day, and I wanted something significantly different from the spherical Star Wars robot, but the result looks more alien than robotic to me. And my third approach, ghah. The fact that the shadow is wrong. This keeps bugging me. But, well, that’s how I drew him. Maybe the next week will turn out more playful and more comic, somehow I felt quite pressured by my own expectations in this week. I want to go for simpler and more friendly this next week. Any of you tried anything? I would love to see it if you drew something! Some of you will know my interest in writing as an abstract thing. 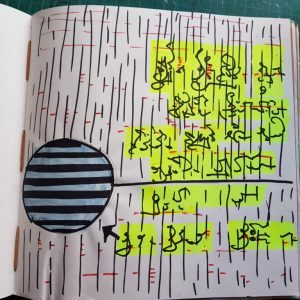 At least ever since I started making (artist) books, but probably much longer I have been very interested in just how writing looks, the abstract idea of putting marks on paper to convey meaning. The magic of reading, when you look at writing, and it’s like a ghost voice inside your head is speaking to you… This is all just very interesting and wonderful to me, and has been part of my artistic work for a while. I cannot clearly recall, when my interest for Japan and Japanese language and writing came about. When I was a child, my father went to Japan for two weeks on a business trip that involved some travelling in the country. He took a film camera with him and came back with maybe a 30min. clip about his impression of Japan. I was absolutely fascinated by it, and must have watched it hundreds of times. But that never really translated to a wish to go there, or learn the language or anything like it. At times, when I touched Japan or Japanese culture here or there, when it came to paper, printing, bookbinding, or pottery, this fascination bubbled up again, but it always vanished: Japan is a long way away, and it never felt completely real to me, I suppose. But over the last couple of years, the interest grew. To an extent that when I came across duolingo (more about that in a minute), after trying out Spanish, French, Polish, and Dutch, all languages I had (tried to) learn at some point – I started to learn Japanese and stuck with it. I have since had my Japanese lesson every day and there came the point where I actually felt confident enough to tell people, that I am learning Japanese. Pronunciation of Romaji is very much like reading them out in German, so for me Romaji wasn’t a big issue, but English speakers actually also have to learn how they are pronounced. That is why for English speaking learners, some discourage learning Romaji. However, knowing Romaji is the best way of typing Japanese on a English keyboard (I am typing Romaji, and then I can chose to replace them with Hieragana or Katakana). It just musn’t be used instead of proper Japanese writing. 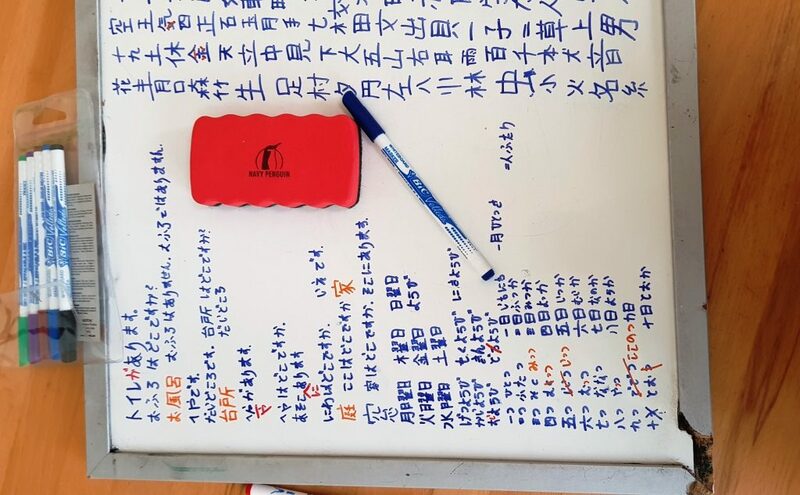 I heard others who tried to learn Japanese and kind of gave up because of the complex writing situation. But probably due to my inherent interest in writing as such, that didn’t put me off. On the contrary, I really enjoy writing. And if learning to read and write kana is the only thing I’ll take away from it in the end, then it would still be worth the effort for me. And the world has never been better for language learners. When I grew up, learning a language meant a huge investment both in time and money: You had to sign up for a language course, pay for it, pay for the books, and then go there once or twice a week and spend the time there. Now there are language learning apps which actually help a lot and are more effective than I thought they ever could be. I am using a couple of apps, and I feel like I am really gaining from using them side by side, all of them are free, some contain ads, for others I voluntarily spend some money, still less than I would have paid for a language course, though. I am using duolingo, lingodeer (this is especially good for Asian languages), Kanji tree (to learn Kanji), and My Time! Japanese Vocabulary (which is a flashcard system to learn vocabulary). In addition, I now discovered italki. This is a plattform, where you can find people to talk with. You can look for tandem partner, people to chat with, or formal lessons (which will cost about the same as taking a course, but you’ll have private lessons). I payed for my first video session this Monday. I signed up for it because I realized that, as good as these language learning apps are, they always present me with multiple choice, and I learn much more to translate Japanese to English, than really to say anything. And indeed, my first half hour of trying to say something in Japanese has been just a bunch of stammers, and learning to really speak Japanes seems like a really long way off. The last language I tried to learn was Dutch. As a German speaker, you immediately understand a lot, and you can start speaking pretty much from the first day you sign up. So not being able to properly introduce myself in Japanese of studying for half a year every day has its frustrating moments. But then I see the writing again, and it just puts a smile on my face. I am currently focusing on finally finishing my novel, thus other projects have to wait in line until it’s their turn again. In German you can say: I pushed everything non-urgent on the long bench. 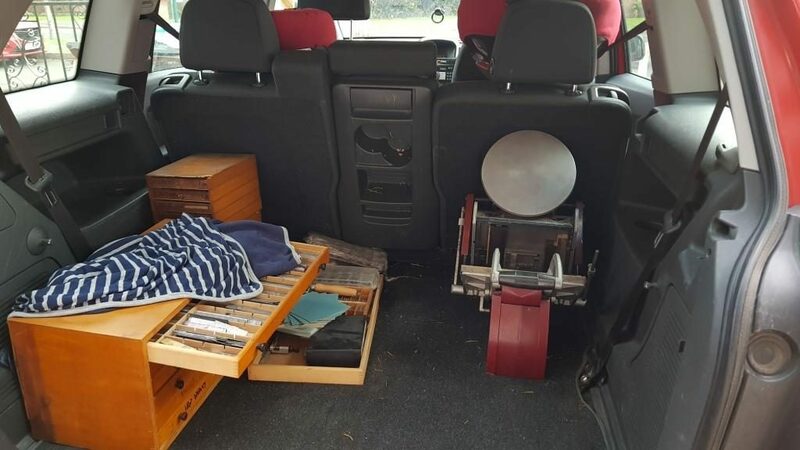 I always imagine a long bench with different projects in boxes like they have them at airport security checks, pushing one in after the other. Every now and then I sort through the boxes, but more often than not it’s a LIFO system, which results in some projects sitting in boxes for a VERY long time, sometimes quite literally. 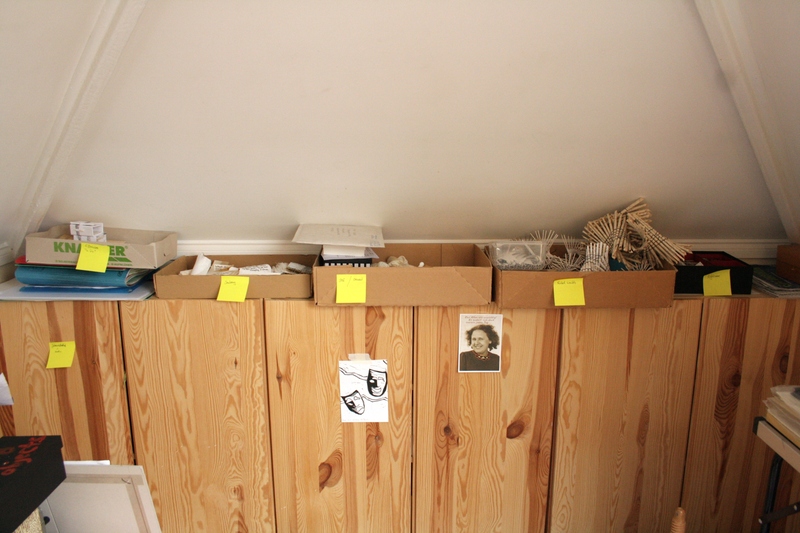 “long bench” in 2018 – not much has changed, actually box on the very right here (of which you unfortunately can’t see the contents) is the same as the one on the top left, the boxes with “ruled world”, … see that bit of paper peeping out under the boxes on the left side, those are from a project about Johannisfriedhof in Leipzig which I started in – uh, 2009 probably or even earlier; the same paper are on the very left in the photo above. Now the thing with benches, imagined or real, long or short, is that when you push too much on it, eventually things will start to fall off on the other side. Which is a good thing. Some things will just never get finished that way but that’s o.k. However, my bench is a bit too long for my own good. Meaning: I don’t forget easily about all those project sitting there. For example I am aware that I still owe you a blogpost on rapidograph pens. You probably forgot, but years ago, I bought rapidograph pens, and ruling pens and all kinds of traditional drafting equipment, and I was making different experiments (that book also needs to get finished) and I wrote some blogposts, 2 I think, about the ruling pens and compasses I got for myself, and I promised a third blogpost on rapidograph pens which I never finished. And it keeps on bugging me. I usually finish work at 9pm and then watch tv with DH for an hour before going to bed, and every night I sit down and call it a day, I have this nagging voice at the back of my head that I really *should* finally write that blogpost. While writing, what I like to do is meditative tasks. 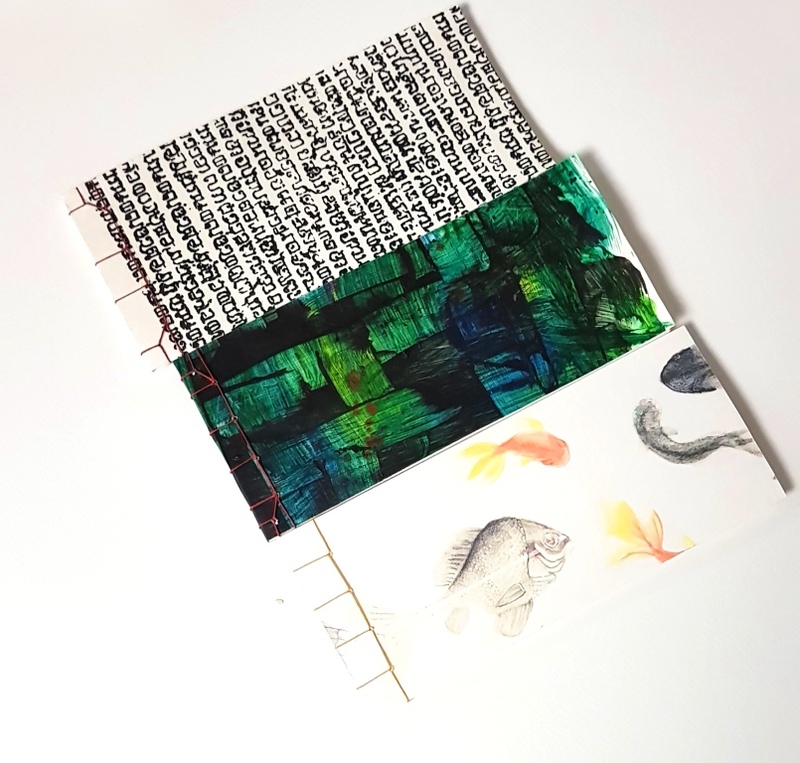 Like folding and cutting paper, or printing small prints, or – probably – ironing (I must admit that I have not tried it; no ironing is done in this household). My favourite meditative task to prepare for a writing session is to walk. Somehow my thinking seems to change when I am moving my feet. I know I am not alone with this, but I find it rather startling and wonderous, really. I start on my computer, and see what problem next needs to be solved. Then I start for a walk, pondering the problem. Often my thoughts will drift, on the landscape I see, or maybe I’ll concentrate on discovering graffiti or whatever. That’s part of the plan, and I let them drift. Eventually they’ll come back to the problem with fresh ideas. Sometimes I can find it hard to give myself the time and room to do that. When I am on the brink of going out, it can seem like wasted time. More often than not, I am hard pressed for time. I am thinking about my time in slots. When one opens up, I think about what task needs doing most urgently. Let’s say a generous two hour slot opens up, then dismissing all waiting orders, ignoring emails that need to be answered, let projects that want to be photographed or finished rest, and go for a walk instead feels luxurious. And because it can be so hard, that’s why I closed my shops for a week when I went to Sheffield last month. But this one week was so successful that I now to schedule time for walks. It’s still hard though. I was planing to be on a walk right now, instead I am at my desk, blogging. The small prints I am making, don’t pile up. They are distributed with the thread I am selling, and I frequently run out. Currently I am painting backgrounds with watercolours generously splashed over large sheets of watercolour paper. 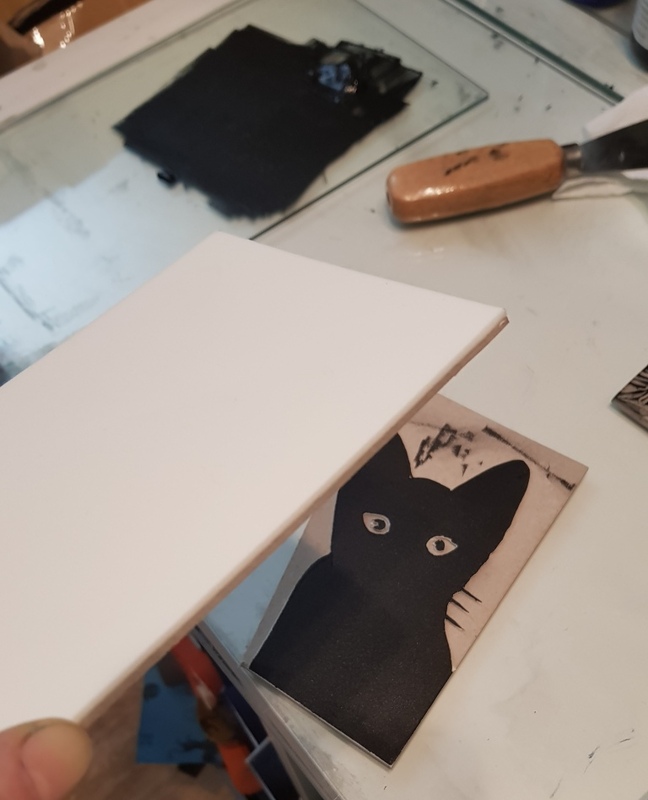 I then cut it down to A4, feed them through my printer to add business information on the back, and then cut it down further to business card size. 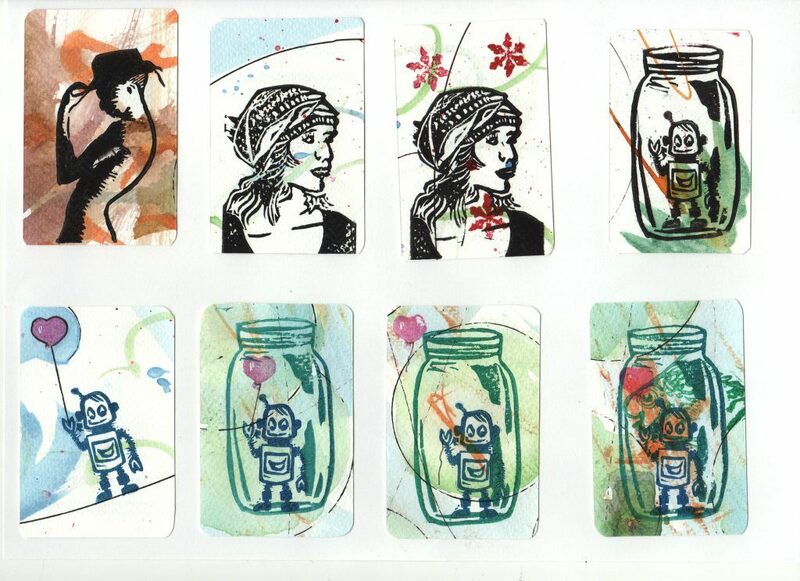 Then I assemble my stamps, try out different colours and combine them here or there. 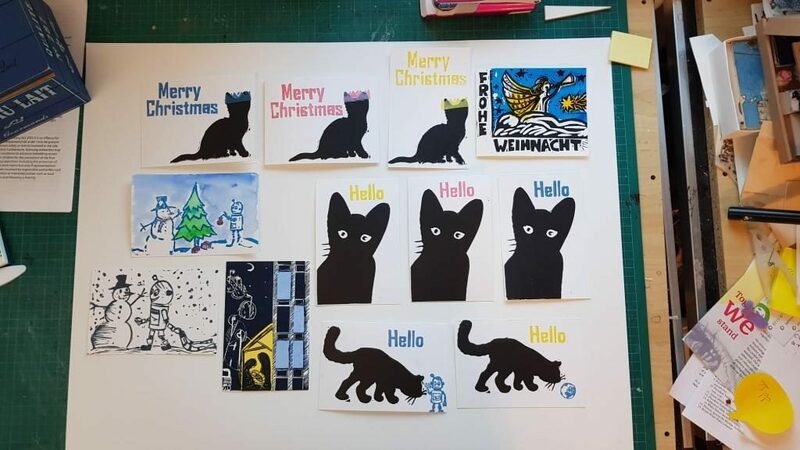 I started with some of my “women with hat” stamps, some of them decorated with snowflakes – it’s getting comparably cold here by now, after all. 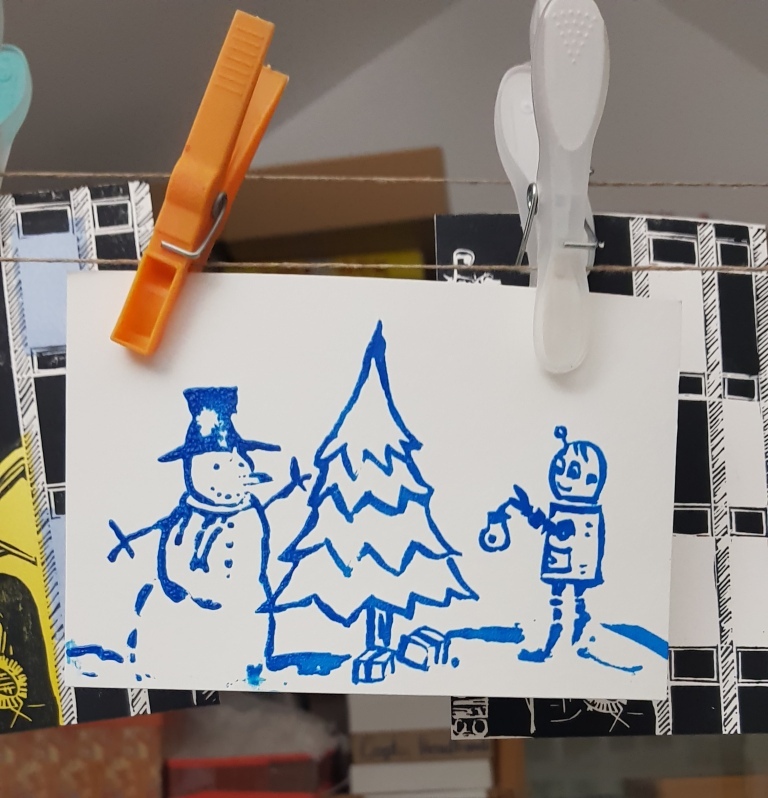 I am wondering whether I should engage on a robot sketching (and printing) challenge. I regret to have failed to maintain a steady pace with inktober, and gave up completely in the first week. But maybe I could make it a six weeks, twelve robots challenge. – It’s six weeks until I’ll close shops for the Holidays. Mhm, anybody wants to join me? 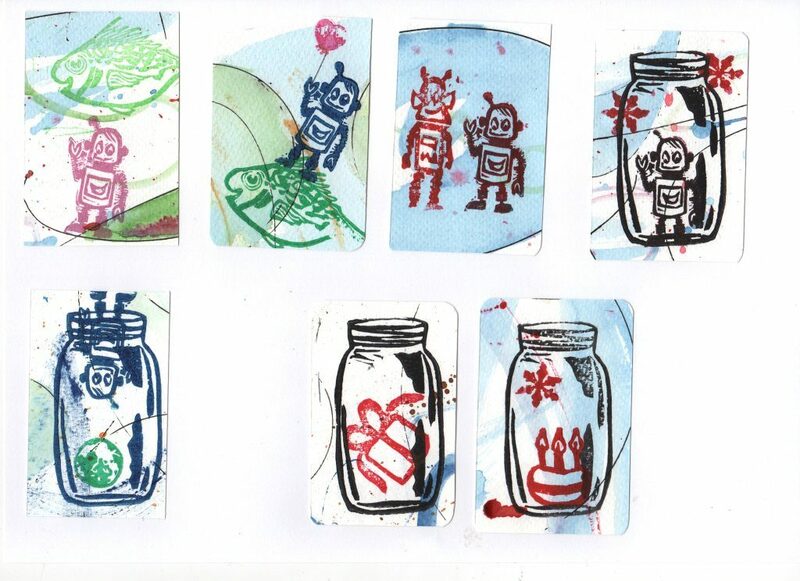 We could maybe make it a robot picture/print swap, too! I talked about my first encounter with Tracey in Wednesday’s blogpost. When I later visited her, she was still in one of the smaller of backlit‘s studios. It was the perfect mirror of Tracey’s warm personality: despite having a cast concrete floor, high industrial ceiling and simple white walls it was welcoming and cosy. The biggest furniture items were a large, simple table and shelves. But the plush comfy chair tugged in the front corner on an old carpet took centre stage once you entered. With a coffee table on the side and a standard lamp beside it, it strongly reminded me of my grandparent’s living room. I later learned that these are part of her “tell me about your mother” interactive installation. I was intruiged by her work from the first moment, and am very happy that she agreed to be interviewed. Currently she is between studios, and we decided to hold this conversation electronically. Nevertheless you might want to imagine us sitting there: Me on the comfy chair, her on an office chair in front of her table, both of us cradling a mug of freshly brewed tea with a dash of soy milk. Hello, Tracey. Thank you for finding the time to speak with me today. When I first met you almost a year ago, you introduced yourself as a “mother artist”. I must admit that this description makes me a bit wary. I myself am a mother, but I come from a place where I am tired of always being seen in a relationship (to my kids) rather than as a person of my own. And I wonder what you have in mind when you call yourself a “mother artist”? 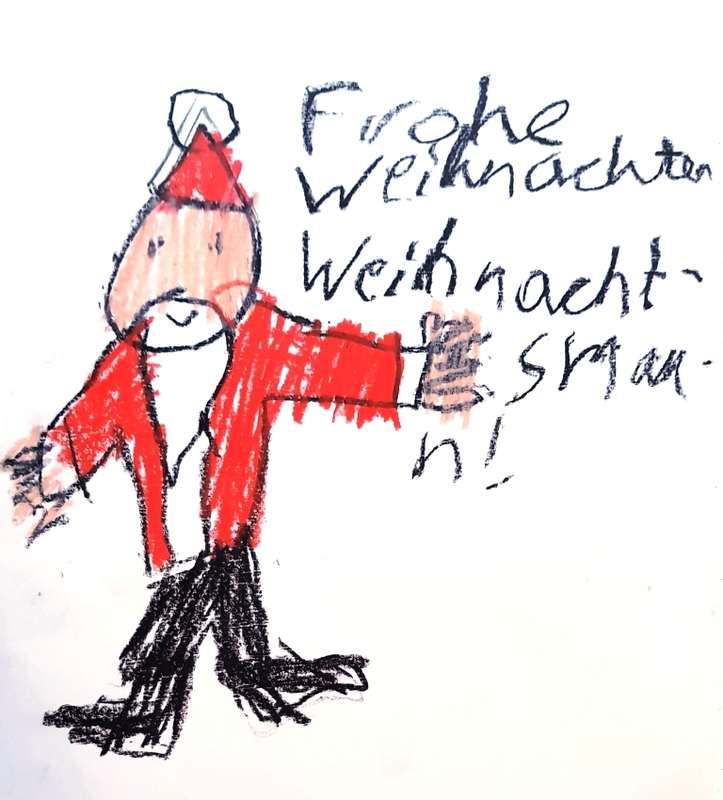 The point when I decided to seriously pursue an artistic career and study Fine Art at university, 15 years ago, coincided with when I had my son. His birth was an absolutely life-changing event, and has since acted as a catalyst for my all my artistic work. Having a very young child was all-consuming, and rather than separating these two distinct areas of my life, combining them seemed a very logical way of working. My son, and my relationship with him became a great source of inspiration, and I began exploring my own maternal position, my understanding of motherhood, and what it means ‘to mother’. Throughout history the classic notion of motherhood, depicting a warm, devoted and nurturing maternal figure, has been preserved both from and for the male viewpoint. Challenging this ideological and narrow framework, my interest is with the differing and multi-faceted roles, identities and experiences of women and mothers. 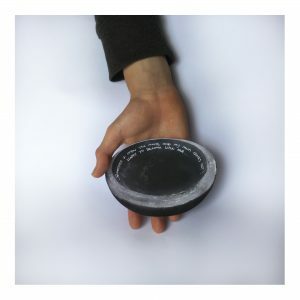 The out-dated and pervading view of motherhood as being a barrier and incompatible with being an artist is now being challenged by thousands of mother/artists from all around the globe who are not only addressing these dual roles but are producing important work that acknowledges and values the experiences of mothers alongside any other life experiences. Probably one of the reasons why I feel a bit irritated by the term “mother artist” is that I feel immediately judged. Indeed the feeling of being crushed by society’s expectations toward me as a mother often feels overwhelming. Yes. Women are judged constantly on whether they’re good mothers within a societal and cultural ‘ideal’ but the reality of motherhood is very different. The expectations around mothering fill women with guilt if they don’t live up to those. I have been thinking about this concept of the “good mother”. It’s such a simple phrase, but the more I think about it, the less clear I am on what it really means. Instead of the concept of the good mother, psychoanalyst Donald Winnicott introduced the idea of the ‘good enough mother’, which aims to value a nurturing relationship, and remove the pressures of perfectionism in parenting. To me, this is a much better benchmark, and one I can identify with. From what I have seen of your work, it seems to me that your “tell me about your mother” installation is the core of all your art activities. Is that right? To me, this has been a central part of my work, yes. 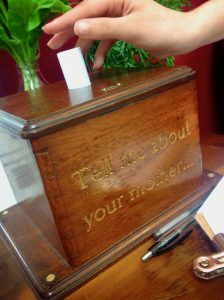 In 2012, during an artist’s residency at Nottingham University, I began to develop the project, ‘tell me about your mother…’ in which I gather anonymous responses from participants that describe their mothers. Since then it has provided inspiration, encouragement and direction for many other projects. What do you want people take away from interacting with your art? And since it is so conversational, I assume it flows in both directions: What do you hope to take away from your viewers? I hope that my art provokes some kind of emotional reaction, and makes my audience think about their own relationships with their mother and possibly their children… what that reaction actually is doesn’t matter so much to me. And I hope for this to be reciprocal: I want to be challenged by other people’s opinions and to get new insights into my own maternal relationships. It may sound like a cliché but through my work I’ve been reassured that other people have a huge range of both positive and negative feelings about their mothers, and that however I feel there will always be someone else with a similar experience. 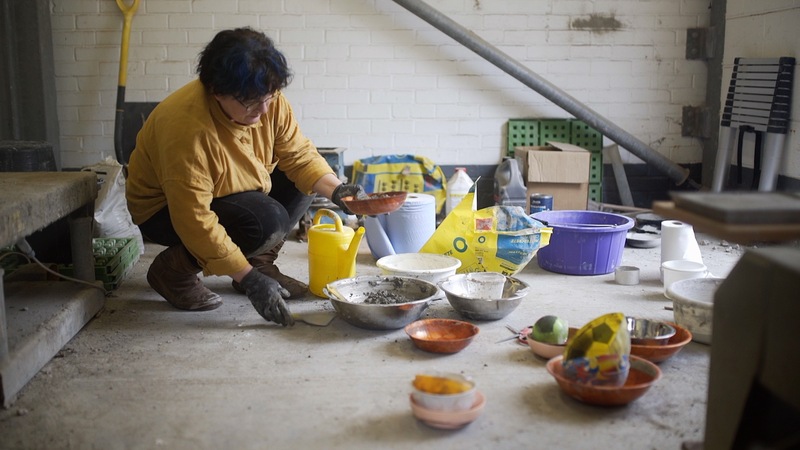 You have since worked on several projects with video, installation and participatory events. 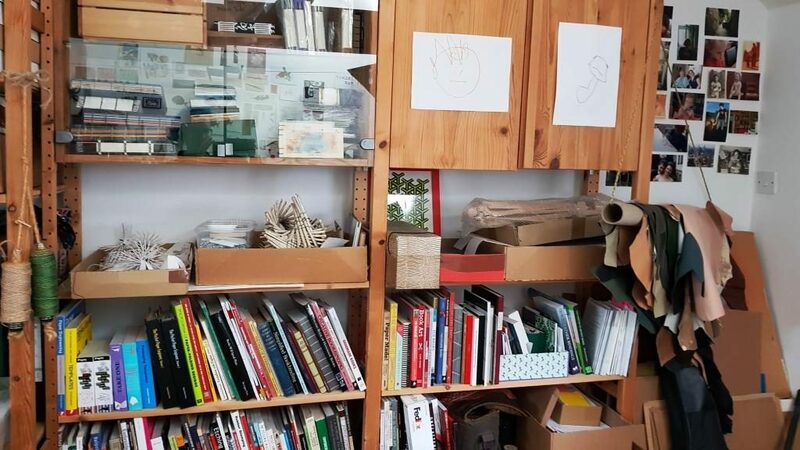 You have worked with different materials, too, with paper, fabric, concrete… Hardly any of these projects simply produce an art object. 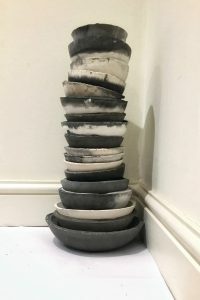 Even the mother bowls still have this element of continuous change: You make one after the other, arrange them differently, and continue working with the finished bowls. — What role does time play in your work? ’Time’ and in particular the passing of time has played a central role in my work. Prior to developing my ‘tell me about your mother…’ project, my work explored issues of impermanence, fertility, aging and the fragility of both time and relationships. I focussed on the changing and ever-evolving relationship I have with my son, documenting ephemeral changes (‘non-events’ from our daily life – brushing his hair, collecting fallen peas from his plate or cutting his nails). 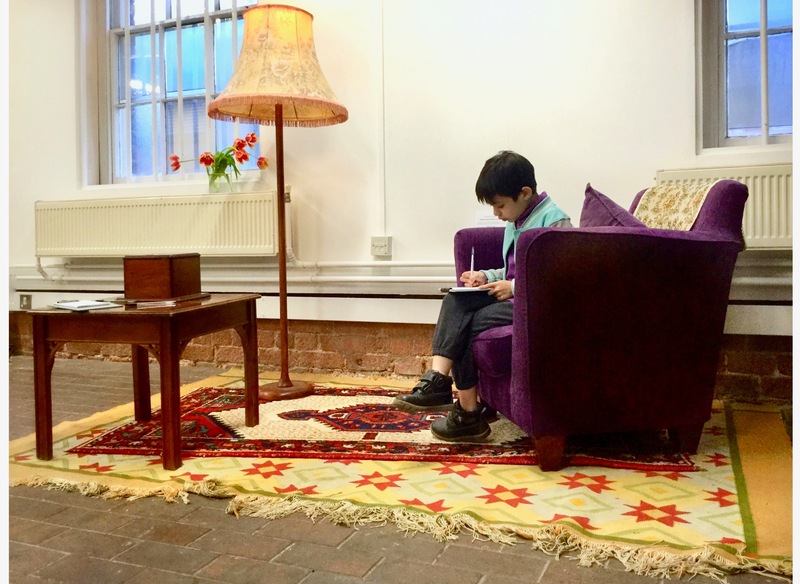 I created a series of works under the title, ’50 things my son doesn’t need me for’, which although speaking of a particular time, represented the more fundamental changes that will inevitably occur as he grows older and gains more independence. I’ve been inspired by the work of many female artists on the topic of motherhood. In particular Mary Kelly’s ‘Postpartum Document’ stood out to me as a groundbreaking piece that reappropriated domestic items and reclaimed hitherto invisible aspects of motherhood as valid topics for art. I love the films of Chantal Akerman, which not only speak of the minutiae of the everyday, but also address mother/daughter relationships, and there are artists that I regularly return to when I am feeling in need of inspiration like Louise Bourgeois, Mona Hatoum and Helen Chadwick. But there are so many other artists whose work has moved and encouraged me, and their passion, commitment and articulation has had a massive influence on me. Helen Sargeant, whose work explores amongst other things, maternal ambivalence, the body, and the affect of the transition of motherhood on a woman’s identity, was one of the first mother/artists with whom I made contact, and she has since been a constant source of encouragement and support. 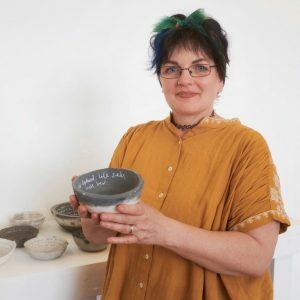 Similarly, artists such as Rachel Fallon, Paula Chambers, Amy Dignam, Lauren Mclaughlin, Megan Wynne and Eti Wade, all make work that resonates with me primarily because of the subject matter. Thank you, Tracey, for taking the time to answer my questions! Maybe one last one: Where do you think you are going? Any new projects planned? I’m at a point now when I want to take a few months out to reflect and reassess where I am. I have no specific new projects planned, but I am certain that motherhood will remain my central focus. Thank you very much for your time and answers! If you would like to see more of Tracey’s work, you can head over to her website, and I whole-heartedly recommend her instagram feed. The photos accompaning this blogpost were provided by Tracey and used with her kind permission.